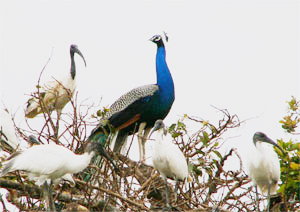 North of Mysore lies Ranganathittu Bird Sanctuary, an area of islands and woodland along the Cauvery River. Santosh and I had a couple of very productive hours here, both walking through the woods, including huge bamboos and on a small boat going around some of the islands. We started with Little Cormorant, Black-necked Ibis, Brahminy Kite and two Crested Treeswifts as we drove into the reserve. As we started walking around the wooded areas I could see various small birds in the canopy. There were quite a few Greenish Warblers and a single Tickell's Leaf-warbler and a female Chestnut-bellied Nuthatch. The trees across the river held hundreds of huge fruit bats plus a lone Stork-billed Kingfisher. A pair of Blue-tailed Bee-eaters were seen distantly but I had better views of River Terns. From the boat we added Purple Heron, Great Egret, lots of Black-necked Ibis, one group accompanied by a male Common Peafowl! A White-browed Wagtail stood on a small rock sticking out of the river and we admired a lone Marsh Crocodile sunning itself on a small island. Our second kingfisher appeared in the form of a Pied Kingfisher soon followed by our third, White-breasted Kingfisher. 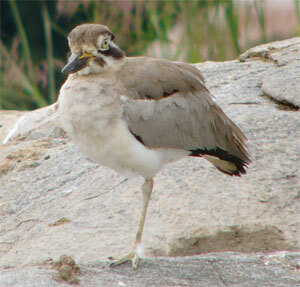 We were soon admiring a pair of close Great thick-knees as we circled one of the islands and had Streak-throated Swallows flying overhead. More usual (for me) species here included Great Cormorant, Common Coot and Common Sandpiper. Back walking through the wooded areas we added Common Tailorbird, a group of five or six White-rumped Needletails and Oriental Magpie Robin. We also came across a female monkey with a baby clutched to it's belly. We stopped and were suddenly hit on the head by a plam branch. We looked around and saw a close-by male pushing the branch down to distract us. It worked because when we turned back the female and youngster had gone. Time was pressing so we left the reserve and set off for Kabini Lodge.